Q: How much does the plague cost? The total cost for a Memorial Garden Wall Plaque is £395 inclusive of ALL Lettering, Fixing, Memorial Garden Contribution & VAT. Q: Do I have a choice of colour for the plaque? N., to maintain uniformity of the memorial garden, all plaques will be made in a Honed Slate Grey Granite and White painted letters. Q: Can I commemorate more than one person on the plaque, either now or in the future? Yes. The plaques can accommodate more names and inscriptions in the future. Further advice and a no obligation scale drawing can be produced allowing you to visualise how the final plaque will look, which can then be shared between family and friends. Q: How many lines of text will fit onto my plaque? We would recommend approximately 8 lines of text for a plaque as a guide. 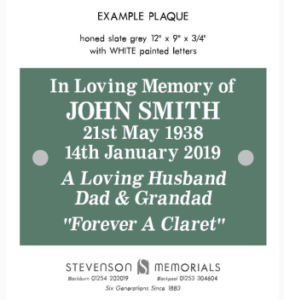 However please contact Stevenson Memorials with your desired inscription and their professional design team will be able to advise you further. Q: Can I have additional designs, such as the club badge, a rose, a hobby / occupation depicted or a photo plaque placed on the plaque? Yes, but this would be at an additional cost and will also impact the lettering space available. Q: Can I choose the preferred position on the memorial wall for the plaque? No. the plaques will be placed in the next available position. Q: What is the next step to ordering a plaque? Either call Stevenson Memorials on 01254 202019 or fill out the order form on this website.